Identify and recognize the benefits of natural daylighting on indoor environmental quality for people and for energy optimization in buildings. 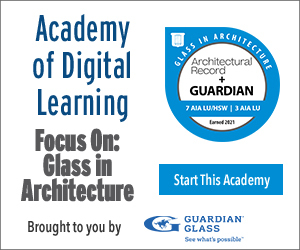 Assess the visual and performance options of different types of glass and glazing. Investigate the updated standards, criteria, and options in LEED v4 related to daylighting in buildings. Incorporate successful daylighting design strategies in a variety of green and sustainable buildings. Natural daylight has always been important and significant in buildings. In some applications, it has been architecturally routine and proportioned, as with windows of many historic homes. In others, it has been dramatic and remarkable, such as the oculus of the Pantheon. Current building designers do well to learn from these historical examples but can also benefit from new tools and options. Specifically, national standards have been developed to ascertain beneficial levels of daylight and to establish associated design targets within buildings. At the same time, sophisticated computerized design and measurement programs can accurately predict the manner in which natural sunlight is received or reflected by various building elements in association with the time of day and the season. Glass and glazing have also become more sophisticated with state-of-the art products, which can be selected to maximize daylight, minimize heat transfer, and limit glare. Architects and other design professionals who are up-to-date on all of these technologies can help to create buildings that are optimized for natural daylighting while keeping in balance with other design requirements. The term “daylighting” refers to the illumination of buildings by natural sunlight. In an era in which we have become accustomed to electric lighting, it is easy to forget that for most of the history of buildings, natural daylighting was a critical influence on architectural form. The central elements involved in daylighting strategies have been and continue to be windows, skylights, other openings, and reflective surfaces. Reinforcing natural human circadian rhythms. Improving patient healing times in hospitals. Improving students’ performance in schools. Daylighting can also benefit building operations. From an energy use standpoint, natural daylighting may be able to replace electric lighting use within buildings for 70-80 percent of daylight hours, correlating with lower energy costs and reduced pollution from fossil fuel-based power plants. For buildings with air-conditioning, reduced electrical lighting creates less internal heat, further lowering energy costs. Daylight can have other operational benefits too. Walmart, for example, has installed skylights in its large stores because daylighting has been shown to increase their retail sales. 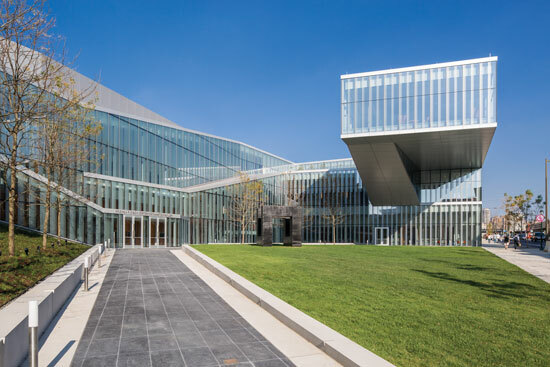 The Krishna Singh Nanotechnology Center located at the University of Pennsylvania and designed by Weiss/Manfredi uses sustainability principles and the latest in high-performance glass to provide abundant natural daylighting in the building. The increasing attention paid to architectural daylighting over the past few decades has been driven by this body of benefits. The human benefits speak to the architect’s role in assuring health and welfare for building occupants. The building impacts address the needs of the building owner and controlling operational costs. All of them are incorporated into the intent and rationale behind LEED credits for indoor environmental quality and optimizing energy performance. With all of this in mind, let’s look deeper into the process of successfully implementing daylighting strategies. The use of high VLT glass for daylighting allows Valley View Middle School occupants to reap the numerous benefits associated with exposure to natural light.